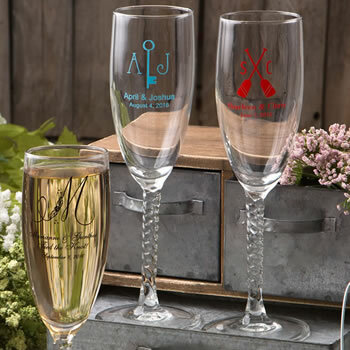 Clearly a fitting choice as personalized wedding favors, or for showers, anniversary parties and much more, these Champagne Flutes are truly unique. From Fashioncraft's Silkscreened Glassware Collection, each measures 8.5" tall x 2.5" in diameter, with a 5.75 ounce capacity, in the classic champagne flute shape with a slender bowl top and an elegant long twisted stem. Made in the USA, each is made of clear glass and they're perfectly fitted to be silk screened with amazing accuracy directly on the glass in a wide variety of all occasion themes, designs, colors and titles that match your theme and your personal preferences. Ready to be filled with a festive bubbly beverage, these personalized champagne flute favors come bulk packed. Please allow two weeks for silk screening and processing as well as transit time for shipping to your location. We ordered champagne glasses for our upcoming wedding in April. The engraving was beautiful and perfect, exactly what we ordered. We placed our order on 3/3, received notification that it shipped on 3/11, and we received it today 3/18; Awesome timing! Thank you Nice Price Favors! Ordering was simply the best. Fast Rasy & they are as beautiful as I had hoped! 💗 Thank you! These glasses are perfect. I was nervous to order but I was pleasantly surprised of the quality of the glasses. You would have thought I purchased from Pier 1. The quality is spectacular!The price affordable! Not one glass was broken and they were delivered before date stated in ordering process. I most definitely will order again!!! They were beautiful, we love them. Thank you very much. I'm extremely satisfied with my purchase. I received exactly what I ordered. Shipping was fast, and packaging was great-no broken glasses. I will definitely make another purchase. The flutes were a hit. I purchased them for my niece engagement brunch. The guest loved them. Because the twisted stem champagne flute was so inexpensive, I was surprised by the quality. The glass is heavy, not flimsy at all. The personalization came out exactly as I'd ordered, and the shipment arrived very quickly. I will use this site again. I like the sample glass. The stem gives it some elegance. Now all I need to do is order from this company. I hope that will go smoothly. 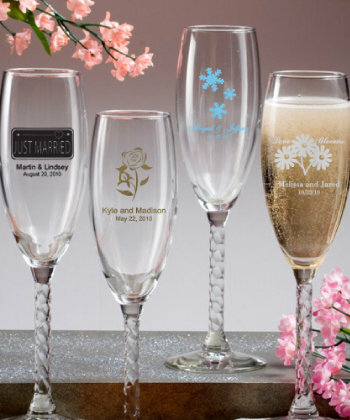 I ordered personalized champagne flutes for my mom's 90th birthday. The items were carefully packaged and delivered in excellent condition. The delivery was received by the date stated in the order confirmation. I will definitely use this site for future purchases. The flutes we ordered for our wedding came out perfectly! Got them shipped with no problem, relatively quickly. They did come with some carboard/packing dust on them so we rinsed them out in the venue day of, which was no problem. None were broken and they looked great! I placed my order on June 9th, 2017 received it June 21st. The packaging was great, all of the order made it to my front porch in one piece. I emailed customer service to change something on the glass and they made it happen for me without any hassle. The glasses were for my moms surprise 50th birthday & she loved them. I'll definitely order again! The glasses were perfect and none of them were broken. Thank you so much for your care and attention to the order. They were processed quickly and accurately. We love them. My twisted champagne glasses are beautiful I fell head over hills for them. Yes I would order again. Thank you. Order arrived in a timely fashion and were all there. They are exactly what we wanted and we are thrilled! 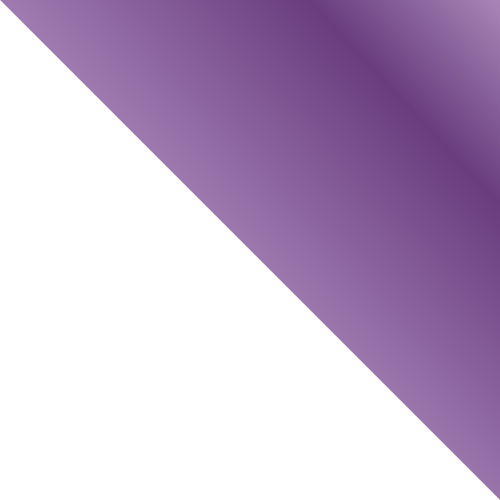 I love a gay wedding friendly company and will recommend your site to everyone! The two brides were perfect! Thank you! I ordered 66 champagne glasses. they were delivered very timely, and with only one broken glass. I was very happy with my order.